It just occurred to me that all this may be permanent. That sounds very silly because Dr. Winslow and others have repeatedly told me that this may be all the brain healing I am going to achieve. Of course my response to Dr. Winslow and the others is sort of a quiet rebellion and determination; much like my response back in 1979 when Doctors told me I was going to lose 75% of the use of my hand. I was not willing to accept that prognosis and fought like hell to get the use of my hand back. Anyone who knows me now would never even be able to guess which of my two hands/wrists was injured severely. I have not given up hope. I still think that I can achieve a lot more improvement. I am still working doggedly on getting the referrals to the help I need. I have an appointment to be evaluated at CORP TBI group at Harborview in mid May (the soonest I could get in). CORP TBI stands for Comprehensive Outpatient Rehabilitation Program [for] Traumatic Brain Injury. But this realization is different from being told something by doctors or other health care practitioners. It’s like on some deeper level I suddenly got it that this really may be as good as it gets. I may forever be stuck with this sort of mental deadness at certain times of the day as well as some of the other disconcerting attributes. If I have seen about as much improvement as I am going to get that is sobering. Hope and “Uneasy Acceptance” are sort of coexisting in me; not at war with each other or vying for attention. If anything the “Uneasy Acceptance” is jumping around in the stands rooting Hope and Hard Work on to greater and greater improvements and achievements. It is like Hope and “Uneasy Acceptance” have become allies. When I wrote the words “Delicate Balance” I went looking for Tom Dundee’s lyrics to the song by that title – which is why I had put it in quotes in the first place. I am going to put the lyrics in right here because they turned out to be even more fitting than I had realized.Therefore, I am putting in a short YouTube of Tom Dundee singing the song as well as adding the lyrics. Somehow there is a beautiful place. Where that devil discouragement lives. Although nothing had hurt me at all. And robs from the pleasure that’s there. To open it and so many more. You’re a part of what everything is. 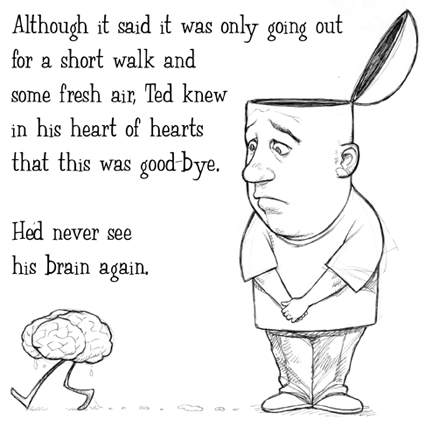 The wonderful cartoon “Tis better to have loved and lost your mind” at the start of this entry is by Jeff Gregory of Jagged Smileand is used with permission. I love his blog and his cartoons! The Serenity Prayer is most often attributed to Reinhold Niebuhr. “A Delicate Balance” is by Tom Dundee. Tom died April 18,2006 from brain injuries he sustained in a motorcycle accident he was in coming home from a gig. Tom, we miss you. “A Delicate Balance” is available on multiple CDs that can be purchased on Tom’s page at CD Baby.